Abolish War! Can We Do It! 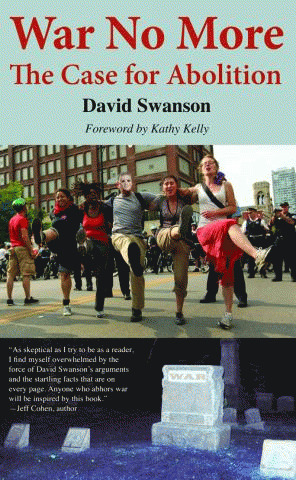 David Swanson says "YES! We Can!" Abolitionists were bold visionaries. In the midst of an economy and a culture built and dependent on slavery, they envisioned a culture where slavery was anathema. They knew in their hearts that slavery was dehumanizing and they set out to reeducate and reform their culture. Within the span of one hundred years they succeeded, for deep in our hearts all of us know that slavery is wrong. Elizabeth Cady Stanton and Lucretia Mott were bold visionaries. In the midst of a 5000-year-old culture built and dependent on suppression of women, they envisioned a culture where misogyny was anathema. They knew in their hearts that second-class citizenship was dehumanizing and they set out to reeducate and reform their culture. They succeeded, for deep in our hearts all of us know that women are full-fledged humans. Gandhi was a bold visionary. In the midst of the hierarchy established by the British Empire in India, he envisioned a culture where empire was anathema. He knew in his heart that empire was dehumanizing for the people of India. He set out to reeducate and reform his culture. Within the span of thirty years he succeeded. He demonstrated that submission to the rule of Empire was voluntary, and millions of Indians followed him. India became a sovereign nation without firing a single bullet. Each of us knows deep in our hearts that sovereignty is our birthright. Nelson Mandela was a bold visionary. In the midst of apartheid, he envisioned a homeland where apartheid was anathema. He knew in his heart that apartheid was dehumanizing for the people of South Africa. He set out to reeducate and reform his culture. Within the span of forty years, many of which he spent jailed by the ruling elite, he succeeded. He demonstrated that the Black and White people of South Africa could coexist peaceably, and millions of South Africans demonstrated and sang in the streets until they made it so. Martin Luther King was a bold visionary"You get the picture. Abolition is possible. Atrocity, no matter how deeply embedded in a culture, is voluntary. It is possible for a whole people to turn its back on it and co-create a better way. The message that it is inhumane will resonate in enough hearts to reeducate and reform the culture. That's what it means to be human(e). I understand that wars and militarism make us less safe rather than protect us, that they kill, injure and traumatize adults, children and infants, severely damage the natural environment, erode civil liberties, and drain our economies, siphoning resources from life-affirming activities. I commit to engage in and support nonviolent efforts to end all war and preparations for war and to create a sustainable and just peace. War threatens our environment . War erodes our liberties .